I've been playing with a double embossing technique lately, so when I saw the new challenge over at Muse Card Club I knew it would be perfect for this technique! 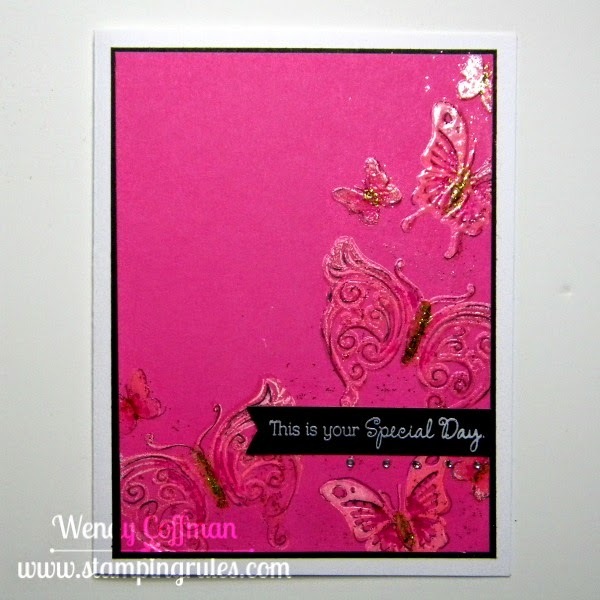 I used the butterflies from Your Own Kind of Wonderful to stamp along the outer edge of the card. 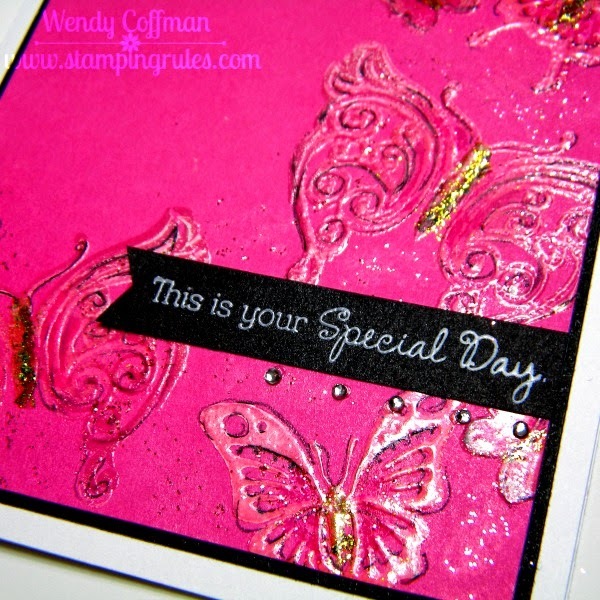 Each butterfly is stamped in pink Pigment Ink and embossed with Clear Detail embossing powder. Then I inked the edges of each stamp again in White Daisy pigment ink, and embossed again with more clear detail powder. Double embossing the images gives a nice depth to the images and really raises it off the paper. Here you can kind of see how "tall" the embossing is with the stacked inks. I darkened the centered of the butterflies with a pink marker, and added sparkly accents of green stickles to the bodies. I also tapped on a bit of pink stickles around the butterflies for extra sparkle. I embossed the sentiment with White Daisy Ink and clear powder too. Finally I added a bit of black ink pen around the edges of each butterfly for more definition and a line of bitty sparkles to emphasis my sentiment banner. Stunning - I thought you had figured out a new magical way to use embossing folders - great dimension and shine! So glad you joined us at Muse! Wow, I have never seen this technique before.....thank you for sharing. I will have to try it. Your card is another stunner! Pure elegance, what a wonderful technique! Absolutely stunning card! I never think of doing these embossing techniques, okay, I never think about embossing at all! LOL! You're making me rethink that. Love the detail that the double embossing has brought out, and with the added features of the stickles, and black lines really does add demenision to the butterflies.